Welcome to our winter edition of the newsletter. We will be in Christchurch to visit the NZMCA Motorhome Caravan and Outdoor show early July, look out below for a chance to win tickets and look for us in the crowd – say hello. Travel safely on the roads, keep chains in the vehicle when travelling in the South Island especially, it is snowing on the Rimutaka’s today by the feel of it as I write this. Keep warm and travel safe. MTA expresses safety concerns over changes to Insurance vehicle glass cover. The MTA is concerned there could be more unroadworthy cars on the road if all insurance companies start charging a policy excess for windscreen replacements. MTA is urging people whose insurance companies stop offering ‘free’ cover for glass, to shop around, particularly if they own a car with a windscreen that doesn’t contain much of the modern technology that has prompted the move. Vero has been the first to make the change. It’s vehicle policy for new (or renewing) customers requires clients to pay a policy excess for any glass replacement. Repairs (for chips and scratches) are excluded from the excess. It’s generally expected that more insurance companies will follow Vero’s lead. “This isn’t likely to happen quickly, so people should shop around when renewing their insurance,” said MTA chief executive Craig Pomare. He’s concerned that the change could result in more people driving around in cars with seriously damaged windscreens. The friendly team here at Challenge Yachts invite you to our spacious new premises, now conveniently located at 20 Saunders Place, Avondale, Auckland. Come and visit our bright new showroom packed full of appliances for your off-the-grid alternative energy lifestyle requirements. Our Challenger water heaters, refrigerators and cookers are designed for New Zealand conditions, providing you with reliable and energy-efficient appliances and accessories for your motorhome, caravan, boat, holiday home or off-the-grid lifestyle. We carry an extensive range of spare parts in our service department to ensure timely servicing when required. We also service most other brands of appliances. With plenty of parking onsite, we can accommodate large motorhomes and trailer boats, so come on in and say Hi. Our new phone number is 09 8200 500. Mention this announcement when you purchase from us up until the end of August, and you’ll receive a free welcome gift. REDARC is proud to announce the launch of its new website developed exclusively for customers based in New Zealand. The new website has been tailored for the New Zealand dollar, simplifying the purchase process for new and existing customers, whilst utilising all of the technical data, product overviews and user manuals previously available to international customers across a wide range of industries such as recreational, heavy vehicle, defence and more. A New Zealand-specific website has been in the works for a while now, with its development being testament to REDARC’s growth in New Zealand over the past couple of years. The new website follows an increase in operations and services for REDARC in the New Zealand market. This has resulted in a steady increase in market presence, highlighted by the appointment of Greg Mitchell as inaugural area sales manager for New Zealand. Greg was introduced in 2016 and has maintained a strong attendance at industry tradeshows, conducted regular training workshops and improved REDARC’s overall technical support capabilities. REDARC has almost 40 years’ experience in the research, design, development and manufacture of a range of electronic voltage converters and associated products, including inverters, power supplies, battery chargers, brake controllers and trailer braking products. REDARC is excited to launch its New Zealand website and expand its online footprint globally. Home comforts are now made easier when travelling in remote areas with the introduction of Dometic Inverters, Chargers and Solar Panels, a powerful range perfect for RV and 4WD owners away from mains-power for long periods of time. To ensure you have a reliable source of power during your trip, the new RTS150 rooftop solar panel uses highly-efficient monocrystalline panels to convert sunlight into a source of power for mobile travellers. Visit www.dometic.com for more information and to find your nearest dealer. In April 2019, Overland Journeys will operate its inaugural Motorhomes Across Russia Tour. This event is only possible because of the long-term associations that Overland Journeys have developed over the years with their Russian partners and suppliers. Roads in Russia have also improved to such an extent that it’s now a reality that modern motorhomes can cross this vast country easily. As recently as March this year, Overland Journeys director Greg Paul was in Eastern Russia plotting the motorhome route, discussing logistics with Russian partners, and arranging the night stop locations. Shipping your motorhome won’t be an issue, as Overland Journeys will take care of all shipping arrangements. Greg says arrangements are looking good for the project, and he believes it’ll be a very memorable and enlightening expedition, taking in a combination of amazing sights, interesting history and the cultural delights of this big and interesting country. The 54-day itinerary starts in May 2019 in Vladivostok, located on the far eastern seaboard of Russia near Japan. “Vladivostok is a mystical and multicultural city with a natural and protected harbour, and is the logical place to start this MH expedition,” he says. The motorhome expedition is based on Overland Journeys’ tried and tested “follow me” concept. An experienced tour leader and tour manager will lead the way on the journey, supported by a tour follower, who will assist with any eventuality, so that no one will be left alone. The maximum size of the convoy will be 10 motorhomes, plus two support vehicles. Having crossed Russia with a professional guide, visiting its numerous and beautiful cities, the expedition will terminate outside the boundaries of Russia at the European city of Tallinn in Estonia. From there, there are lots of choices of direction to continue your journey independently, and Overland Journeys can assist with making forward arrangements and route planning, based on its extensive experience in Europe. The cost is NZ$37,000 per vehicle, based on two people per vehicle. Overland Journeys has produced a portfolio of requirements and suggestions for the Across Russia by Motorhome expedition, detailing tour costs, the itinerary, the required documentation, a tour manual and maps, and individual timeline schedules. It also has an easy payment schedule available if required. Looking for extra space in your RV? Check out the 8.6m Jayco Optimum IV.29-5 below: the space in here has to be seen to be believed. Or if you’re looking for something under 6.5m the Auto Trail Tribute T625 below from Nationwide RV could be for you, with its large rear lounge. This is the ideal motorhome for longer trips in supreme comfort, with a range of new features that enhance its comfort, safety and handling. This newly-upgraded motorhome sleeps up to four and is packed with luxury features that come as standard. The space-efficient kitchen includes top-quality kitchen appliances such as convection microwave, induction cooktop and dishwasher. To create spacious living areas, it has a large lounge and bed slide-out, and you can personalise the interior of your motorhome with a wide choice of leather upholstery, fabrics and finishes throughout. tyre. Your safety on the road is paramount which is why airbags and diff locks for improved traction are standard features. The feature-packed 2018 Jayco Optimum Motorhome is now available for NZ$259,990. Peta Stavelli checks out the two-berth Tribute T625 low-line from Nationwide RV. Firstly, I check out the very welcoming rear lounge, which is one of my favourite lounge layouts. Its deep fabric-covered settees convert to a large bed at night, while above the lounge is a variety of storage lockers and shelves – a good combination that allows for a mixture of uses from stowing to showing. The double-glazed windows feature privacy blinds together with fabric curtains. is flanked by a nice touch of floor-to-ceiling wood panelling. Amidships on the habitation door side is the galley – a compact but functional space with three-burner hob, under-bench oven with grill, and a sink with under-bench refrigerator. The in-built microwave is overhead. The Tribute T625 is the low-line model with storage above the cab and its aerodynamic body is built on a Fiat Ducato base. Under the bonnet you have a 130 BHP diesel engine with six-speed gearbox. The driver and passenger seats are fully upholstered and designed to swivel, and the cab has all the comforts and safety extras we’ve come to expect from Fiat. Some new features in this year’s model are the new livery, and a new exit door with inbuilt window, waste bin and umbrella holder. Chrome crockery holders have been added to the kitchen lockers, and the fridge/freezer capacity has been upgraded to 96L. The LED lighting system has also had an overhaul. This vehicle has air-conditioning, a 3.5 metre roll-out awning and reversing camera, and is sold with Auto Trail’s five-year/300,000km Fiat chassis warranty. Coastal Motorhomes and Caravans is a family-owned and operated business based in the Eastern Bay of Plenty town of Whakatāne. Growing a company and living in a coastal town that enjoys some of the greatest sunshine hours in New Zealand, has certainly rubbed off on the team at Coastal. It’s always nice to experience the warm, relaxed feeling that carries through all dealings with the Farrell family and their colleagues. Mike and Gayle Farrell’s Coastal journey began in 2001 when they bought a run-down saleyard and began to rebuild it, almost from scratch. As the company expanded, Mike and Gayle began to see an opportunity to bring their adult children, Paul and Toni, on-board. The only snag was the two were happily living and working abroad, and it wasn’t until they could finally be persuaded to return from their respective OEs in 2003 that they completed the current line-up of Farrell family members at the helm of Coastal. As with any small business, the Farrell team is multi-skilled and able to move between most roles. Mike and Paul look after the custom-build side of the business with Paul also overseeing the busy three-bay workshop, while Mike works on the design of the new builds and works with Paul spearheading new developments. Toni is in charge of the sales side of the business, as well as handling customer support with specific queries and insurance needs. Coastal is known for its high-end custom builds. The majority of these are based on Mercedes-Benz chassis, and are built by craftsman using time-honoured skills and the best materials, combined with the latest technology. To date, the company has built 115 custom-made vehicles, with their latest creation causing quite a stir at the recent Covi SuperShow. The Coastal Club of custom-build owners meets regularly for rallies, and the popularity and repeat custom generated is indicative of the integrity of the Coastal brand name. Each new build carries the same high standard of construction, while ensuring the customer gets the motorhome of their dreams. The company builds no more than eight motorhomes a year, and it’s the hands-on and hand-hewn combination that has proven a winner for the team. Paul says the team is committed to helping buyers achieve their dream of having a holiday with no restrictions. Part of that is quality assurance, and the rest is the knowledge that the Coastal team is on-hand to ensure all customers’ vehicles of choice remain in top condition. Coastal’s three-bay workshop is always busy and the team continues to innovate, investing in equipment specific to the motorhome industry’s needs such as the installation a few years back of an RV roof-cleaning service. They also install varied electronic equipment and maintain a parts and accessories shop. In this way Coastal has become a one-stop destination for travellers. The team are certified Self-Containment Officers, so can carry out work to NZMCA standards. And they’re also aligned to major RV suppliers, working closely with preferred suppliers to ensure the integrity of the parts and accessories they sell. One of Coastal’s specialties is the installation of satellite and solar systems, with the latter becoming such an important part of their business that the company has recently started installing household solar systems too. And continuing to move with the times, a state-of-the-art lithium battery system (remotely controlled with a phone app), that had tongues wagging at the recent Covi SuperShow, is just part and parcel of the team’s commitment to progress. For travellers in the sometimes-isolated Bay of Plenty region, Coastal’s eastern location means they’re perfectly placed to help out with insurance claims or other issues, should the worst occur. So, whether you’re stopped in your tracks by some unforeseen event, or you’ve decided to drop-in while passing, there are a lot of worse places than Whakatāne to bide awhile. And you’ll receive such a warm welcome that you’ll likely leave feeling part of the family. Are desserts and sweets your passion, then this recipe extracted from Sweet by Yotam Ottolenghi and Helen Goh (Ebury Press, $65) photography by Peden + Munk, will inspire you. We have one copy of Sweet to be won. To enter, answer this simple question: What is the author’s name? This is a stunning dessert for a special occasion. It also has a nice element of surprise, as the meringue base is not quite what you might expect: gooey – almost toffee-like – rather than dry and crispy. This is due to the brown sugar in the mix. Combined with the praline cream and fresh figs, it’s absolutely delicious. Pavlova is the dessert to make when you have a bit of time and are feeding people you adore. The recipe calls for flaked almonds but you can easily substitute those with chopped pistachios, as photographed. Serves 10–12 (it’s quite rich, so the slices are not too big). The praline (after blitzing but before it’s mixed with the cream) can be made up to 3 days in advance and stored in an airtight container. The meringues need to be made in advance – they take 3 hours to cook, 2 hours to cool in the oven, and another 2 hours to set, so you’re forced to get ahead by at least this much – but they’ll also keep for up to 3 days loosely wrapped in foil. 3. Reduce the oven temperature to 120°C/100°C Fan/Gas Mark ½. Cover a large baking tray with baking parchment and trace a circle, about 23cm in diameter, onto the paper. Turn the paper over so the drawn-on side is facing down but still visible. 5 minutes, until the meringue is cool, stiff and glossy. Add the cinnamon and whisk to combine. 5. Spread the meringue inside the drawn circle, creating a nest by making the sides a little higher than the centre. Place in the oven and bake for 3 hours, then switch off the oven but leave the meringue inside until completely cool: this will take about 2 hours. Once cool, remove from the oven and set aside. 9. To assemble spoon the cream into the centre of the meringue and top with the figs. Warm the honey in a small saucepan and stir through the 20g almonds (or pistachios, as pictured). Drizzle these over the figs, and serve. In a country blessed with hundreds of spectacular tracks to choose from, these are considered the best of the best. They pass through some of our most breathtaking landscapes – including golden sand beaches, ancient rainforests and high mountains. New Zealand’s Great Walks is the only handbook anyone will need to experience these outdoor adventures. Each of the walks (and one river journey) is presented in a clear, user-friendly way including: highlights, planning notes, track description, points of interest, a brief history, conservation information and other things to do in the area. Published 3 September 2018 | RRP $45.00 in all good book stores. Click here to go into the draw to win a copy! – Entries close Aug 31st. The NZMCA Motorhome, Caravan & Leisure Show returns to Christchurch, Friday 6, Saturday 7 and Sunday 8 July 2018. We have 6 entry tickets to be won. Entries close July 3. For all lovers of the great Kiwi outdoors, a bigger show featuring all your favourite brands is on its way to Horncastle Arena, in Jack Hinton Drive, Addington, Christchurch. The 3-day show features a great range of motorhome and caravan manufacturers and importers, with a host of new products and new exhibitors. There are some truly great innovations on offer, along with an array of accessories and unbeatable deals for you. This is your best opportunity to come along and talk to the experts over the three days and find exactly what you’re looking for. If unadulterated leisure is your thing, you’ll find a large number of motorhome and caravans and all you need to complete your love of the great outdoors, from fishing and camping equipment, to inflatable boats and electric bikes. 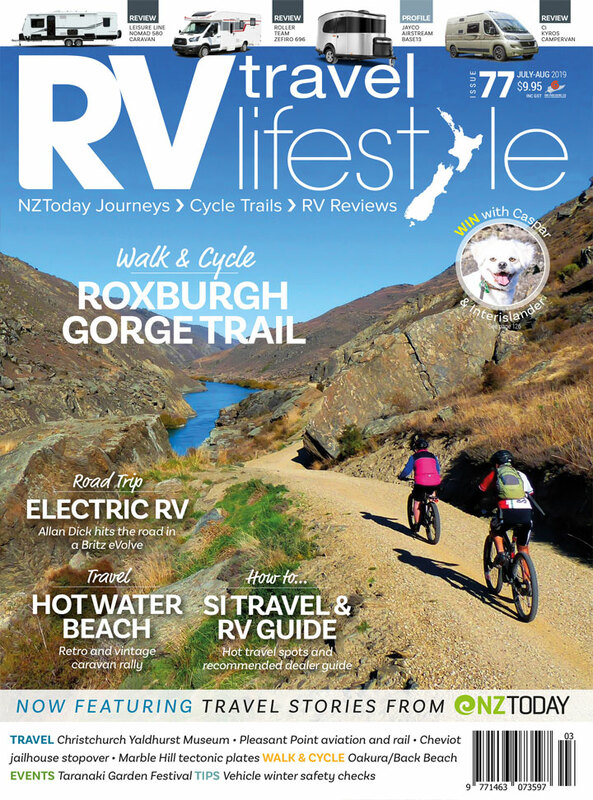 You can even enter to win your dream New Zealand holiday, thanks to RV Super Centre and Off the Beaten Track. Up for grabs is a 10-day Maui Motorhome rental to get you Off the Beaten Track in our beautiful country – and it could be all yours by entering at the show. Come and make a weekend of it and stay for free at the Event Park & Stay. This is the South Island show you can’t afford to miss: the NZMCA Motorhome, Caravan & Leisure Show, Horncastle Arena, Christchurch. Click here to go in the draw. Winners will be notified by email, tickets can be picked up in Christchurch. Entries close midnight July 3 2018. Is bigger better when it comes to house batteries? This issue we continue to talk batteries. Greg from REDARC answers the question. Bigger is better in many cases, especially when it comes to touring New Zealand. Well-engineered and over-spec’d equipment will generally see you through the toughest conditions with headroom to ensure reliability and to cope with unexpected extremes. If you look at the specifications of leading brand equipment, they’re usually on the more conservative side of what the gear could actually do, unlike the optimistic competitors selling on price-point alone. The conservative approach will ensure that the equipment delights rather than disappoints. There are times when finesse is more important than brute force. For example, if your vehicle capacity exceeds your requirements with room to spare, it’ll more likely perform better for longer than one that’s always loaded to the maximum, resulting in accelerated stress and fatigue. If the design is far more capable than the noted conservative rating, you have brute force on your side for a tough, long-term partner in touring. Looking at the other side of the coin, that same vehicle’s engine is tuned for drivability and performance, using finesse – when you want to stretch its legs on the highway, the controlled and skilled approach to timing and air fuel mixtures will reap far more response and performance than just throwing everything on flat out, which will also cause excessive heat and stress on components. Electrical components are no different. And a comparison like the above can be drawn between battery charging and its associated wiring. When it comes to wiring, there’s no substitute for brute force. As with anything, there’s a time when increasing cable gauge further will give less benefit, but making a pretty looking job of something won’t help if the wire is too small. Battery charging on the other hand is much like having the right timing and air fuel mixture for your engine – it’s finesse that will deliver performance and service life from your battery. So how do you know what type of tune your battery requires? Leading battery manufacturers provide detailed data sheets for their batteries. These will identify the correct charging regime, discharging characteristics, cycle life and depth of discharge impacts, and some even cover temperature and its impact on performance. Leaving voltages aside at this time, as a good multi-stage battery charger should have a suitable profile for most of the common batteries – instead let’s explore the often claimed “bigger is better” topic of charging current. Firstly, it’s important to realise what is meant by charging current from a battery charger. Voltage is the pressure which makes the current flow, and current is the volume of energy moving. So, getting the voltage right is important, and backing that with the correct amount of current is where finesse will out-perform brute force day-in-day-out. Excessive current flow into a battery has a range of impacts. The worst impact is the degradation of battery service life and capacity. The effect of over-current will generate excessive heat in the battery, leading to a lower gassing point, which in effect can cause the electrolyte to dry out prematurely. In the case of an AGM, gassing causes bubbles to form on the plates which may be difficult to recombine and result in less active area of the plate to accept and deliver charge. In extreme cases, active material can be torn from the plates which also decreases the batteries capacity, particularly in flooded cell batteries. Another effect is buckling of the plates due to rapid heating, this can cause shorts between the plates, or breakages. Often this battery will “drop a cell” and will die a sudden death without even a loss of capacity over time. At the least, the effect is that less energy is stored by the battery if charged faster than the recommended rate. For example, a 100Ah battery charged at its recommended 20A rate may take 120Ah of charge transferred to it so it can store 100Ah over a 6-hour period. If you applied a 40A charge rate for the same period of time, it could in effect only store 80Ah as the chemical conversion still takes time to occur – even though a massive 240Ah had been transferred to it. The extra power has just been turned into heat and caused poor storage capability – what a waste of energy! There are two methods of getting the right amount of current into your battery. One is battery selection. At the end of the day, batteries take time to charge, but some are faster than others. This characteristic is not only governed by their chemistry but also physical construction. For example, automotive Lithium batteries generally top the list when it comes to charge current acceptance. That is by chemistry, but the cell and internal electronic construction is key to the batteries actual current capabilities. Similarly, an AGM battery can have flat plates or spiral (orbital) wound plates. A flat plate 100Ah AGM may take up to 30A of charge happily where as a spiral construction 75Ah may take upwards of 100A all day! This is all about plate surface area, where the flat plate may have 180mm x 200mm of plate surface, compared to a spiral cells 1000mm x 200mm! Check the specs and select the battery with a charge rate that suits the time you need it to charge in. Then you pair it with the appropriate charger. For example, the 100Ah AGM with a 30A recommended charge rate would work well with the REDARC BCDC1220 (20A) or BCDC1225D (25A) In-Vehicle Battery Chargers or Manager30 Battery Management System (30A), but the BCDC1240D (40A) would be too much current. Using two of the 100Ah AGMs or one of the spiral construction AGMs, and the BCDC1240D or Manager30, would be a great combination. Understanding the design of your battery system and setting it up how you need it to work, is far more important than buying the cheapest 100Ah AGM you can get your hands on. Likewise, with choosing your charger – bigger is not always better. Tune your charging system and battery correctly, and you’ll get many more miles from it than you would by just “opening the taps”.